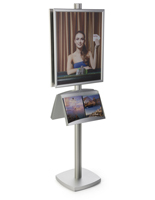 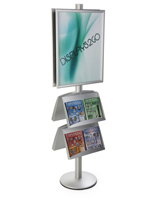 This silver 22x28 poster and brochure display is a 2-sided aluminum floor stand that comes with a graphics frame and 4-pocket information holder. 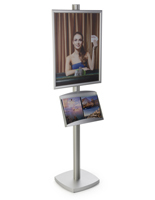 The mounting channel on either side allows this versatile fixture to be customized or used with additional accessories from our Forte line. 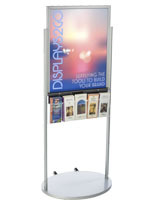 Each floor standing silver 22x28 poster and brochure display comes with protective acrylic lenses to keep graphics safe from damage. The four brochure pockets are molded into the rack and sized to hold 4" x 9" literature. This stylish silver 22x28 poster and brochure display is a great choice for heavy traffic areas because the base is made from steel and weighted for additional stability. The four pocket information holder and acrylic-protected graphics display are ideal for integrated marketing campaigns that have signage and takeaway literature. 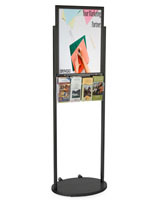 32.0" x 56.0" x 17.5"